Kilbeggan Traditional Irish Whiskey is a popular Irish Whiskey available from TheDrinkShop in 70cl to buy online. Visit TheDrinkShop for the best price for 70cl of Kilbeggan Traditional Irish Whiskey or compare prices on our other Irish Whiskey products. Kilbeggan is Gaelic for 'little church'. Nose: Traces of sweet oloroso plus some sweet malt that over powers the clean grain. Taste: There is an abundant lushness, where the malt moves freely around the palate, gathering honey notes along the way. Finish: The dryness purveys with some genuine oaky tones coming through. Serving Suggestions: Kilbeggan Irish Whiskey can be served neat, on the rocks or with water to taste. It is also an excellent ingredient for cocktails and perfect with mixers. Kilbeggan Irish Whiskey first appeared as a John Locke's brand over 100 years ago and was sold successfully until Locke's distillery ceased production in the 1950's. Locke's distillery is the oldest continuously licensed whiskey distillery in the world dating back to 1757. Drawing on centuries of tradition and craft, Kilbeggan Irish Whiskey is distilled from the purest clear water and the finest malted Irish barley and maize, gently matured for long years in oak casks in the ancient warehouses in Kilbeggan and skilfully blended to create a whiskey of unique smoothness, character and balance. Cooley relaunched the Kilbeggan brand in 1994 and it has had continued success in the market place. Where to buy Kilbeggan Traditional Irish Whiskey ? Kilbeggan Traditional Irish Whiskey Supermarkets & Stockists. 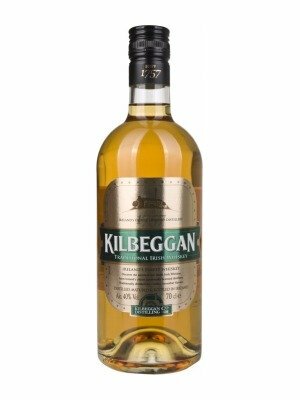 You can buy Kilbeggan Traditional Irish Whiskey online in most retailers and find it in the Irish Whiskey aisle in supermarkets but we found the best deals online for Kilbeggan Traditional Irish Whiskey in TheDrinkShop, Amazon.co.uk, DrinkSupermarket.com, and others. Compare the current price of Kilbeggan Traditional Irish Whiskey in 70cl size in the table of offers below. Simply click on the button to order Kilbeggan Traditional Irish Whiskey online now.